I've been feeling incredibly emotional about this somber anniversary for a number of weeks now in a way that's caught me off guard. I remember that horrible day as though it were yesterday, and I just can't believe he's been gone for so long. I've been in love with Conway since the very first time I heard him as a little girl. His voice gives me goosebumps - always has, always will. From a throaty growl to a sensual whisper to a throbbing crescendo, there's isn't anything he couldn't do. In my eyes, he's pure perfection in every way. In 1973 Conway stirred up a bit of controversy with the steamy (for it's time) You've Never Been This Far Before. In spite of being banned by many radio stations due to its "racy" lyrics it ended up being his only country song to cross over onto the Top 40 of the Billboard Hot 100, where it peaked at number 22. So did Conway make the right decision by crossing over from rock to country? Over the course of his country career that spanned 28 years he earned 55 #1 hits, putting him second on the all-time list in all genres of music behind only George Strait. That's more #1's than Elvis, the Beatles, Michael Jackson, Sinatra, Madonna, anyone. He had #1 records in 5 different decades, from the '50s to the '90s...who else can claim that? Who would ever be able to do that today? His level of greatness will never be seen again. In the years since he's been gone his legend has only grown, being posthumously inducted into both the Rockabilly and Country Music Hall of Fame. He has even been introduced to a new generation of fans thanks to Family Guy! His peers honored him with the title "High Priest of Country Music." He was called "the best friend a song ever had." And he will always hold the key to this country girl's heart. He wuz a very talented guy! Purrs to you - my human actually feels the same way a lot about David Bowie. His music meant a lot to her, and she was devastated when he died, and no one other than those close to him even knew he was sick. You know your Conway, Melissa! I’m a country girl and didn’t know all this. It doesn’t seem possible it’s been 25 years, since his passing. I still love "It's Only Make Believe" and I'll pull up a Conway song from different eras on Youtube regularly. I've always listened to all sorts of music, and I always liked it when I heard someone cross over, it wasn't so difficult back then when radio stations played a bigger mix of music. Too bad you never got to meet him. On June 3, 2003, TW's friend Joe who was lead singer for one of her favorite local bands, Winter Hours, ODed. She misses both he and his music so much it hurts. His music will always be a part of her. Of course today is also the 50th anniversary of the day Bobby Kennedy was assassinated. 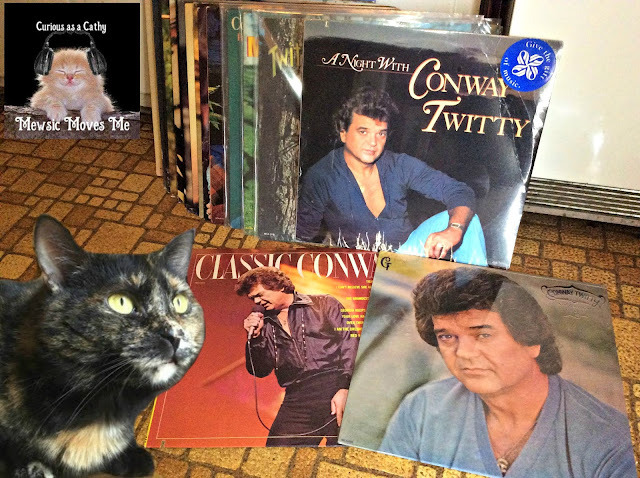 My dad and I were just talking about Conway Twitty yesterday, and my dad was telling me how Conway started out in rock and pop. I did not know that. I also did not realize today was the anniversary of his death. Hugs to you. He is a true country and music legend. I didn't realize that it has been 25 years since his dead. Hold the fond memories in your heart! Wow. I haven't seen a record for YEARS! What a talented performer ... I can only imagine how amazing it would've been to see him in person! Wonderful tribute to a great singer. Conway Twitty was an amazing performer. SO talented. I can't believe it's been 25 years since he passed! Great tribute! I feel the same way about Elvis Presley, John Lennon and George Michael. I was very young when Elvis and John passed away but I still remember the day so clearly. And of course, George's death is still very recent and I still can't believe he is gone. What a very nice tribute. I'm not very familiar with him, so it was nice to read about him. What a beautiful tribute - I had no idea Conway was so young when he died.